The main challenge for plant-based cooking is the fact that eggs are off-limits. While not everyone loves them (I have never been a massive fan except for shakshuka), they are very useful; especially when baking! Luckily, some very clever people have come up with a great egg alternative that is very accessible and works well in things like cakes, veggie burgers and pancakes. You can use this method in every recipe where an egg is used as a binder (to hold the whole show together). The replacement is ground flax or chia seeds (often referred to as flax/chia meal) with a few tablespoons of water and a few minutes in the fridge. Chia seeds are much more gelatinous and therefore do not really require chilling, but the drawback is that they are not the cheapest things to buy. Flax seed with water (commonly called a flax egg) looks like an unlikely egg replacer until you put it into the fridge for 15 mins. The cold thickens the mixture considerably and makes it ready for use. Furthermore, both flax and chia seeds are extremely nutritious so don’t feel bad for sneaking them into your recipes. Flax seeds are rich in micro-nutrients, dietary fiber, magnesium, vitamin B1 and omega-3. In addition to what flax seeds offer, chia seeds have copious amounts of phosphorus, calcium and the antioxidant selenium; which is has been linked to lower cancer and heart disease risk. According to the highly entertaining book about running, Born to Run, it is one of the reasons that the Tarahumara are the incredible athletes that they are so why not give flax and chia eggs a try. PS: If you make my flax and chia eggs explained, don’t forget to tag me on Instagram as @lazycatkitchen and use the #lazycatkitchen hashtag. I love seeing your takes on my recipes! 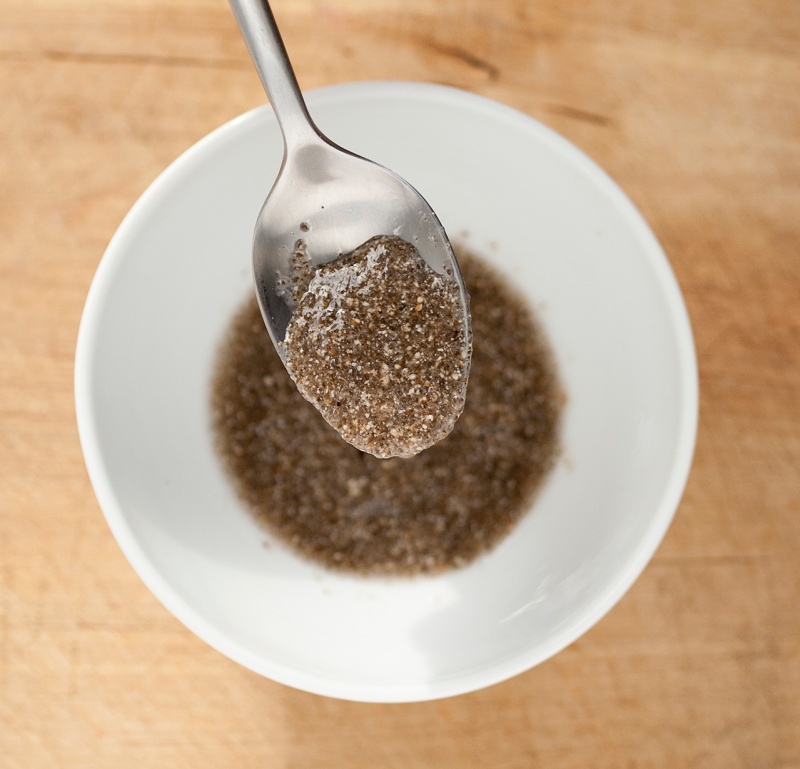 Put ground flax or chia seeds into a bowl and stir 3 tbsp of water into it. Chill the mixture in the fridge for about 15 mins. If you are using chia seeds chilling isn’t necessary as they turn into ‘egg whites’ before your very eyes.